If you are new to cheese making, please read Beginning Cheese Making carefully. Mozzarella is a challenging cheese and should not be attempted as your first cheese. I do not yet consider that I have perfected my mozzarella to approach that which I have had in Italy, but the following recipe is makes a fine tasting, tender, succulent approximation. Of course, they make theirs with water buffalo milk, which HAS to make a difference. The critical step is to get curds acid enough to “spin.” I have had problems getting it to spin in the past, mostly (I believe) because the curd had not acidified enough. This recipe makes delicious mozzarella when proper spin is achieved. When it hasn’t spun, the cheese is still good, but not what I was hoping for… I am eager to hear any improvements which you may offer to improve the process and/or product. I use goats’ milk. The classic Italian calls for water buffalo milk (! ), but cow’s will do. Warm milk to 32°C in sterilized stainless steel covered pot . Meanwhile, dissolve rennet in 1/4 c water. Blend yogurt and buttermilk together, add a small amount of milk, whisk into 32°C milk. Stir in dissolved rennet thoroughly. Cover, let sit in warm spot until gelled (clean break), about 45 minutes. Cut curd with clean knife into ½ inch cubes. See information in the Related section below for further instructions on cutting curd. Re-warm to 32°C with stirring, cutting larger chunks of curd into smaller pieces with table knife. Let sit 15 minutes. Pour off whey (save for ricotta). Cover while letting it drain. Checking for proper acidity using the “spinning” technique: a) Heat 2 c water to 85°C. b) Drop several chunks of curd in, stir gently with a fork. If it softens and draws into strings (“spins”), and appears glossy on the surface, it is ready. If it breaks when you pull it, let sit several more hours until it does.
. Once the curd will “spin”, break or cut up the curd into pieces about ½ inch diameter. Place cut curd back in shallow glass baking pan. Press or cut the hot cheese into pieces (mozzato in Italian) and form into balls about the size of a lemon (size depends on how you wish to use it. In Italy, they are most often about 2 inches in diameter). The balls should be glossy and smooth on the outside. Here is a finished ball of mozarrella. Plunge into cold salted water (1 Tbl salt/quart) and store in the refrigerator a few hours to firm up. It may be stored for several days in this brine, but is best when it is freshest. Ideally, when freshest mozzarella is cut, the thin “onion-like” layers of stretched should be visible, surface smooth and tight and a texture between rubbery and soft. The “onion” layers disappear after less than a day after making. I believe that the problems I have had making mozzarella are primarily due to insufficient acidity in the curd. The result is a tough, rubbery mozzarella. You may know that the classic and simple Neapolitan service of this delicious cheese is to slice it, and serve on slices of fully vine-ripened tomato slices, drizzled with olive oil and then balsamic vinegar, and finally sprinkled with fresh basil, salt and freshly ground pepper. Kitchen Cheesemaking by Lue Dean Flake, Jr, Stackpole Books, (1976), p. 72. Use a graph-lined 10.25 x 7.875 inch composition notebook. Mount the provided name plate on the front of the book as shown. Mount the two lab schedules (first half and second half of the course) on the inside cover and the facing page (page i). The second half schedule will be distributed half way through the quarter. Mount the First Half Handout Table of Contents on page ii. Fill in the page numbers in your notebook where the protocols are to be found as you mount them in the notebook. Reserve page iii for the Second Half Handout Table of Contents, to be handed out half way through the quarter. Type up and mount your table of contents for the contents of your notebook on pages iv and v.
When you hand in your notebook the second time, mount the table of contents for the second half of your notebook on pages v and vi. Mount the Index to Prepared Micro Slides on page 1. Leave the “Page in your notebook” column uncovered so that you can enter the page number of the respective illustrations. Mount Micro Laboratory Notebook Procedures on page 2 of your notebook. Before handing in your notebook for grading, type up 3-5 comments or suggestions on a single page as specified in the Lab Notebook Procedures. Mount it as shown. Type up any new wordstems given which were not in the cumulative list of wordstems with the date given. Mount it on the last page of your notebook and indicate the date you mounted the typed list. This recipe for a basic hard cheese works for any kind of milk. I primarily use my own fresh goats’ milk, but have made it quite successfully with cow’s milk purchased from the grocery as well as raw cow’s milk from a local farmer. I always use rennet tablets because of their dependability and availability from many supermarkets. I usually make 5 gallons of milk into cheese at a time in a 5 gallon Volrath stainless steel pot. Its thick aluminum bottom pad prevents scorching. Five gallons of milk produces a 5-6 pound wheel of cheese . Try several other simpler cheese related projects before you try making a hard cheese. I have written a page on Beginning Cheese Making for this purpose. It might also be wise to master the process for one gallon of milk before making cheese from 5 gallons. The following images will show the critical steps in practically any cheese making endeavor. Alternatively, you may use 3 tablespoons (45 mL) active cultured buttermilk as starter. 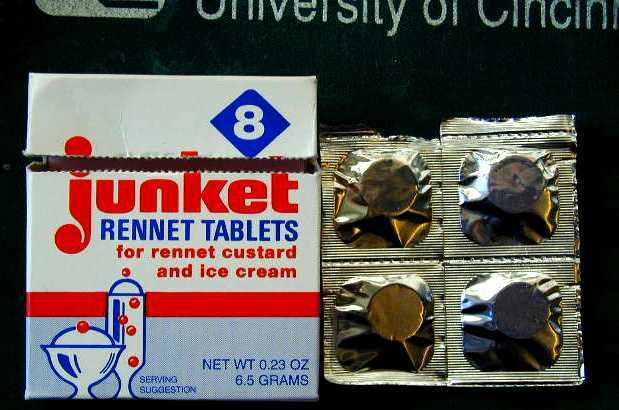 1 tablet rennet “Junket Rennet Tablets” come in a package of 8 tablets (6.5 g) , by Redco Foods, Inc., P.O. Box 879, Windsor, CT 06095 (formerly the Salada Foods Division). Here is what the back of the package looks like. Stainless steel pot (with a heavy thick bottom is best) or enameled pot, 5 gallons, with lid, sterilized. THE NIGHT BEFORE YOU MAKE CHEESE: 1.a. Sterilize the pot: The evening before you plan to make cheese, place a small amount of water in your cheese pot, cover, and heat to boiling for 10 minutes to sterilize the pot and lid. 1.b. Warm 5 gallons of milk to 20°C (68°F) in a sterilized pot: skim the cream off of five gallons of the freshest milk (save for ice cream ). Warm the milk to 20°C (68°F) slowly so as to not scorch the bottom). 2. Add starter: Blend 1 cup yogurt with 2 cups warmed milk until smooth, stir into the five gallons of warmed milk to thoroughly mix. Alternatively, you can use 3 tablespoonfuls of active buttermilk as starter. Because the bacteria in buttermilk grow much faster at room temperature than those in yogurt, do not incubate longer than 8 hours or warmer than 70 For the milk may over acidify and begin to clabber. Partially clabbered milk will not yield a clean break. The function of this inoculation with bacterial starter is to lower the pH so that the rennet will be able to act on the milk protein (casein). THE MORNING YOU WILL MAKE CHEESE: 4. The next morning, [OPTIONAL: skim off additional cream, if you like, it makes delicious pancakes). ]: Slowly warm milk up to 30°C (86°F). Take care not to scorch it on the bottom. 3. While the inoculated milk sits, dissolve 1/2 tablet rennet in fresh cool water. 6. Add dissolved rennet to warmed milk with stirring to mix. Cover, let sit undisturbed for 1 to 3 hours. 7. TEST FOR A “CLEAN BREAK.” THIS IS NOT A “CLEAN BREAK”: To test for “clean break” (completed action of rennet), probe a clean finger into (hopefully) gelled milk and lift. If the gelled milk is not firm enough to split cleanly as you lift, let milk sit until clean break is obtained. (Do not stir.) This may take as long as 3 hours. Be patient, do NOT disturb the milk. Keep warm. Here is a page to help you diagnose the problem of inability to get a clean break. 8. THIS IS A “CLEAN BREAK” When the gel is firm enough to break cleanly as the finger is lifted, go to next step. 9. Once a clean break is achieved, cut the curd with a long blade: Begin the cuts at one edge of pot, cut straight down the side to bottom. Cut repeatedly parallel to first cut, but increasing the angle of the knife until you reach the other side of pot. 10. Rotate the pot 90 degrees, repeat series of cuts as before. Rotate and cut a total of three more times (four in all), yielding ½ inch cubes of curd. Cover and allow the curds to settle for about 15 minutes. Pour off the whey above the curds, saving for ricotta if you like. 11. “Cook the curds”: After sitting for 15 minutes and pouring off excess whey, place pot over a low fire, stir curd with thoroughly cleansed bare hand by reaching down to bottom, gently lifting with an open hand to stir. Cut larger curds as they appear. Do not mash or squeeze. If you want to set aside some for a type of cottage cheese, remove a portion of the curds at this steps and refrigerate before you raise the temperature. Stir continuously as you heating (curds will clump together otherwise), until the milk is 34°C (95°F) for soft curd cheese, or as high as 39°C (102°F)for very firm cheese. Note: you need a quality thermometer for this ‘cooking’ step: a small change in temperature makes a great deal of difference in the consistency of the curd/cheese. 12. Stir and maintain desired temperature until curd has contracted to consistency of firm scrambled eggs. Remove from stove. 13. Separate the curds from the whey: Let the “cooked” curds sit for a few minutes. The curds should sink in whey. [If the curds float , you have a gas-producing contaminant in your starter. It does not necessarily ruin the cheese, indeed, you might WANT bubbles in your finished cheese. But floating curds are more difficult to separate from the whey than sinking curds.] Decant off whey through a strainer (you may line the strainer with clean cloth if the curd is very fine grained). 15. Place curds in a large bowl. 16. Salt the curds: Sprinkle 1/4 cup salt over curds, working with hands to mix. Pour off accumulated whey. The salt is necessary so that the cheese will not spoil as it cures. I have tried making cheese without salt and it rotted. However, unsalted, uncured cheese may be frozen until use. 17. Load the press with the salted curds: Place the still-warm salted curds into a cheese press. (See separate page for assembly of cheese press .) It is necessary for the curds to be warm in order for them to ‘knit’ together to form a solid cheese during pressing. 20. Age to develop a rind: Place the bandaged (wrapped) cheese on a non-corrosive rack (plastic or stainless steel) in the refrigerator. Replace “bandage” daily as long as it continues to become wet. Turn the cheese so that it dries evenly. 21. Wax the cheese When the cheese has formed a dry yellowish rind (two or three weeks), dip in melted wax , store in refrigerator for at least a month (if you can wait that long). Let age longer for sharper cheese. Here is the finished wheel of cheese two weeks later with a wedgecut out of it. I did not wax this wheel since we were going to eat it immediately. [The stains on the outside of the wheel are from being in the iron (“tin” can) press too long: it remained in the press for30 hours, and the iron in the can reacted with the curd… Though I do not think it to be a problem health-wise, it doesn’t look as good as it might otherwise look. I have since switched to a pressing cylinder made of PVC pipe. Persons have asked about PVC leaking vinyl chloride into the cheese. I do not think there is a serious problem for two reasons. First, the cheese is under pressure, and the whey tends to flow OUT of the cheese. Second, it is exposed for only a few hours].